In the end, it's the games that matter. The anticipation that this game may produce something special. It's why we sit through Titans 47, Rams 7. It's why we sift through blogs and trade rumors and box scores. We like the games. We picked the 25 best games, matches and races of the decade -- believe us, it wasn't easy -- and listed them in reverse chronological order. We want you to rank the best. Enjoy the look back as ESPN.com writers remember these classics. The song is a lie. That was the first thing that crossed my mind when I walked out of Madison Square Garden sometime near 4 a.m. The city does in fact sleep. Or at the very least power-naps. Aside from a stretch of cabs lined up on Seventh Avenue, there wasn't much happening in New York City in the wee hours of March 13, 2009. Maybe Gotham was just worn out after hosting what goes down as one of the most unforgettable college basketball games in memory. Six overtimes, three hours, 46 minutes, beginning at 9:36 p.m. on March 12, ending at 1:22 a.m. on March 13. I remember everything and nothing all at once. I remember seeing Eric Devendorf hop on the press table just a few feet from me at the end of regulation, celebrating and gesturing at the crowd, convinced his 28-footer at the buzzer had won the game. I remember Kemba Walker nearly scoring from midcourt at the second OT buzzer. I remember the usher standing sentry in front of me during game breaks, sometime around the fourth OT, muttering, "Can't we just go to a shootout?" I remember laughing the laugh of the overtired and punchy with my colleague Mark Blaudschun from The Boston Globe after Andy Rautins hit a tying 3-pointer, erasing what had been a Connecticut six-point lead in the third overtime. Mostly, though, I remember the crowd. No one left the arena, and more, no one sat down. The groans when shots failed to fall to end the game in the first, second and third overtimes gave way to cheers when the game wasn't decided in the fourth and fifth extra periods, the basketball masochists among us clearly hoping the game would never end -- and no doubt recognizing this would be the ultimate "I was there" game to brag about to the poor suckers who didn't score a ticket. 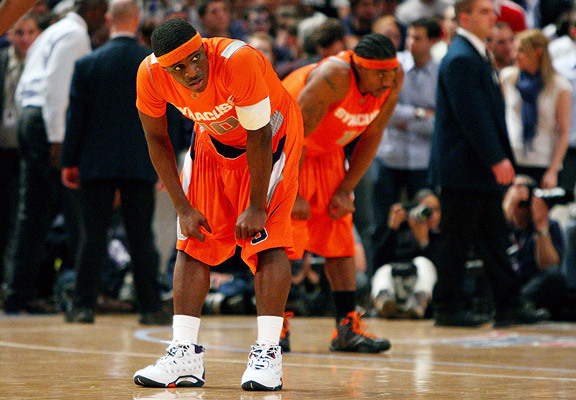 Afterward we crowded into the tiny Syracuse locker room and around Jonny Flynn. He had just played 67 minutes, scored 34 points and dished out 11 assists. He looked like a dishrag wrung dry, with every bit of sweat and energy poured out of him. I halfway knew how he felt -- minus, of course, the physical exertion, cramping, sweating, exhaustion and pressure. I spent 14 hours in the Garden that day and night, arriving for the noon tipoff between Villanova-Marquette, a buzzer-beating Wildcats win that I was so sure would be the best game on the day that I quickly dashed to the computer to write it. A few hours later West Virginia upset Pittsburgh, another great game. And then the game that would go down in history. When I finally opened my eyes the next morning, my father called me in my hotel room. "Were you there?" he asked excitedly. "Yeah, yeah I was," I told him. "I saw it." And, I wanted to add, I saw the city, fast asleep. Page 2: Do you know your aughts?